Daniel Day-Lewis’s final film (if stories are to be believed) reunites him with his ‘There Will Be Blood’ director Paul Thomas Anderson in ‘Phantom Thread‘, the story of a dressmaker in 1950s London. It’s a curious film and if it wasn’t for the talent both in front and behind the camera I don’t think it would have interested me nearly as much, but the combination of Day-Lewis and Anderson promises, and delivers, far more than the initial premise would suggest. Day-Lewis plays Reynolds Woodcock, a renowned fashion designer who creates dresses for members of high society in a large townhouse that he shares with his sister Cyril (Lesley Manville). Both are unmarried although Reynolds often has relationships with younger women, if they are willing to put up with his particular idiosyncrasies (and Cyril, to an extent). That brings us on to the film’s main focus, Reynolds relationship with a young waitress called Alma (Vicky Krieps), who becomes his muse and lover and ‘Phantom Thread’ charts this tempestuous relationship from its origins. The relationship between Reynolds and Alma is a fascinating depiction of a toxic, co-dependent relationship where the early lust gives way to the reality of two people with little in common who constantly push each others buttons. ‘Phantom Thread’ seamlessly depicts why these two people stay together despite their differences, aided by a typically committed performance from Daniel Day-Lewis and an excellent display from relative newcomer Vicky Krieps. This material would be pure melodrama in most directors’ hands, but Paul Thomas Anderson is such a master of his craft and he elevates the material to something more multi layered and complex. A perfect example of this is a sequence on New Year’s Eve that encapsulates everything wrong with their relationship, yet somehow also shows why they are drawn back to each other. Beyond the initial discussion it’s almost entirely wordless, allowing Jonny Greenwood’s impressive score and the performances to do the heavy lifting and I found it quite intoxicating. The third key performer in the ensemble is Lesley Manville who plays Reynolds icily cold sister with relish and she features in many of the film’s finest moments. There aren’t many actors who can truly get under the skin of a character like Daniel Day-Lewis can and in ‘Phantom Thread’ he brings to life a difficult man who can be charming one moment and controlling the next. If this is indeed his final film it’s a strong finale to a terrific career and he will certainly be missed. 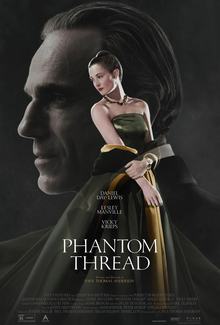 In the case of some films, you just have to sit back and marvel in the craftsmanship on display and ‘Phantom Thread’ is absolutely one of these films. It is perfectly structured and imperious on every level and I enjoyed it far more than I thought I would given the premise. Back in 2015 we did a retrospective of all of Paul Thomas Anderson’s films – feel free to check out what we thought about all of the films directed by one of the finest working filmmakers in the business.